A Green Line train to Norwalk departs Redondo-Marine station. Photo by Brad Jacobson. LA Metro plans to reconfigure its light rail operations may turn the existing South Bay-serving Green Line into a five-station shuttle that connects with the forthcoming Westside-serving Crenshaw Line. However, it will have to do so in the face of representatives of more than 40 communities that are opposed to the plan. At Metro’s next Board of Directors meeting on Dec. 6, the board will decide between two operations plans to join the existing Green Line with the Crenshaw Line. Under both plans, Crenshaw would connect with Green at a mid-line location between Mariposa and Aviation stations, as well as a connection to the LAX Metro Connector “people mover.” The issue at hand is networking. One option, plan C-3, would establish a Green Line short-line between the Redondo and Willowbrook/Rosa Parks stations, with increased train frequency. That would maintain a direct ride from Redondo Beach to Blue Line connections to Downtown LA and Long Beach. 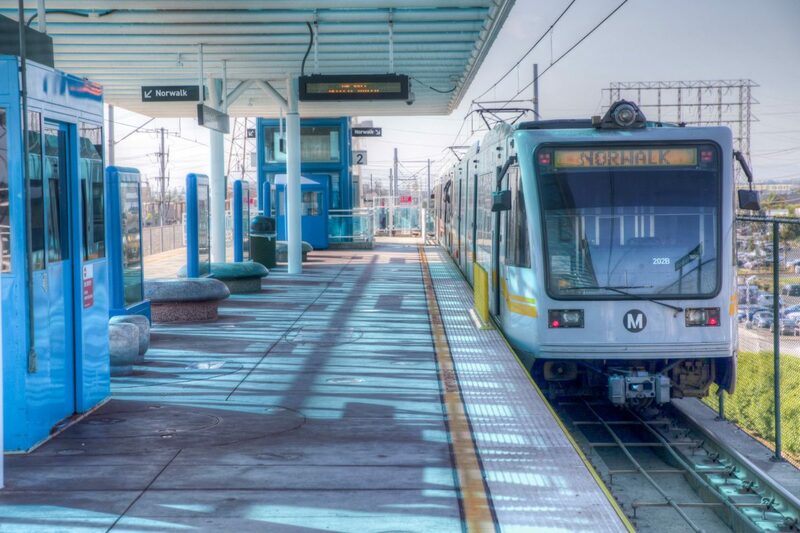 It would also establish a one-seat, or direct, ride between Norwalk and the Expo Line, which Crenshaw connects to. The other, plan C-1, would turn the South Bay portion of the Green Line into a five-stop shuttle terminating at Aviation/Century Station and requiring riders from the South Bay to transfer to Crenshaw to go north, or to the Green Line to go east. The one-seat ride between Norwalk and the Crenshaw/Expo connection would still be built. C-3 is estimated by Metro to cost $11 million more than C-1 in annual operations expenses. Metro’s staff report also notes that C-1 “provides a new opportunity to travel north/south from South Bay,” and would have special service to Inglewood’s planned stadium district. The Green Line is already Metro’s least-trafficked rail line, with an estimated weekday ridership of 30,183 people through the first half of 2018, which shows a 2,000 rider decline from the same time period in 2017. There is long-established distrust between the South Bay and Metro, with some believing that Metro works to expand service while leaving the South Bay cities behind. That perception was bolstered by Metro’s original attempt at passing the C-1 plan as an administrative item, without board discussion, in July. That was halted by LA County Supervisor Janice Hahn, a Metro board member, who represents the South Bay. Hahn successfully pushed for the discussion to be held while staff further reviewed its plans, and appears to be supporting the C-3 plan. Multiple sources have said that Hahn appears to have majority support of the Metro board in favor of the C-3 plan, but that Metro staff also appears to be lobbying board members to support the C-1 plan. Metro did not provide comment by press time. “By cutting off the South Bay from the rest of our light rail system and disadvantaging current riders five years before the completion of the Airport Metro Connector, Metro will lose loyal riders who won’t return to public transportation,” the Council stated in a letter.